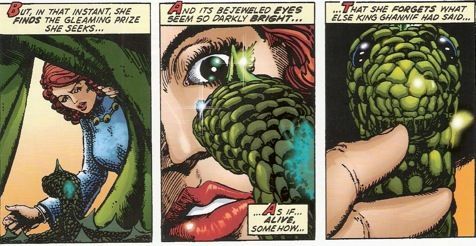 Editor’s Note: This week’s guest blog is a special treat — a look at the buried treasure that is the Ultraverse from two men who were there at the start! Along with a host of high-powered comics creators, Chris Ulm and Tom Mason played critical roles in the foundation of the Ultraverse, which might just be the greatest comic book universe you’ve never heard of! In an age where Marvel is bringing Ant Man and the Guardians of the Galaxy to the movie screen, the time may be right for the Ultraverse’s return! Take it away, Chris & Tom! Hey, Disney executives and producers with a Disney deal in your hand or a desk on the lot — have we got some ideas for you! As you know, your Marvel Comics properties are all locked up and tied together to create a Marvel Movie Universe that mirrors the founding comic books. But, if you look on the fringes of Marvel’s super-hero properties, you’ll find a few gems in the Ultraverse, a universe of comic books that Marvel purchased from Malibu Comics back in 1994. There are several titles that could be pulled out to start their own tentpoles separate from the Marvel Universe. Here (in no particular order) are our top five! High Concept: Ancient Warrior Knight Reincarnated In The Body Of A Soccer Mom! There’s nothing you guys love more than a body-switching movie. It’s been a reliable box-office performer ever since Freaky Friday. Sometimes, you have such a switch-crush that you’ll make two of them in the same year. In Mantra, an eternal warrior named Lukasz is killed but reincarnated into the body of a woman, Eden Blake. Now, you’ve got a manly-man warrior with the attitudes of a guy from centuries before stuck in the body of a single mom with two kids and an ex-husband. However you pitch it, it’s Highlander meets Switch and that’s either comedy gold or high drama. Too many super-heroes? That’s what the so-called pop culture critics say. Somehow four super-hero movies in one year is too much for them and they need more idiotic rom-coms or weepy historical dramas instead. If you’re one of “those” people, then Firearm is your antidote: he hunts super-heroes. He’s no angry vigilante, though. He used to be in a British secret agency called The Lodge, but he “retired” and moved to California to set up shop as a private eye. But his cases are far from normal and usually involve crossing paths with both good and bad super-heroes, including the super-hero serial killer called Rafferty. The big man of the Ultraverse, he’s Superman and Captain Marvel all in one. A boy named Kevin Green transforms himself into a super-hero by “building” a super-strong hero shell around himself. The shell is built from organic liquid skin that ejects from his body. And when he transforms back, the body withers and spits him out. But that’s not the best part — he’s super strong and has basically all the powers of Superman, but he’s controlled by Kevin, a 14-year-old boy, with a boy’s experiences and emotions. So the world’s most powerful super-hero is an inexperienced, hormonally-charged teenager. The teenager never goes away — he’s always trying to masquerade as an adult. Once again, that’s either comedy gold or high drama. Rune was a walk on the dark side. Rune, an ancient energy vampire, had many guises through the history of mankind: alien, sorcerer, beast, god, devil. Now he is dying of cancer and only the blood and energy of super-humans can stave off imminent death. Rune has it all: secret societies, government conspiracies, teenage romance and a story that spans the history of humanity. Random passengers on a cable car get struck by energy and find themselves changed beyond recognition, with strange powers. Who becomes a hero? Who tries to hide? Who uses their newfound powers for evil? These are the questions that drive the strangest collection of super-heroes ever assembled. While suited to film, this property seems tailor-made for episodic television in the tradition of Lost or Under The Dome, with seemingly random characters thrown together, and then tested in the crucible of paranormal circumstances! Drawing from classic super-hero comics, hard science fiction, horror and epic fantasy, the Ultraverse was known for its epic premises and imaginative takes on classic tropes. Many of the best concepts could not have been realized as movies because the state of the art for CG was not up to the task in 1993, and the audience was not sufficiently literate in all things comics. Now, that’s all changed — comic books drive box office world wide and it’s about time the strange and wonderful corridors of the Ultraverse were explored on the silver screen! Chris Ulm was a co-founder of Malibu Comics and the Editor-In-Chief of the Ultraverse, which was based on his original development. He co-created the Ultraverse title Rune with artist Barry Windsor-Smith. Chris Ulm is now CEO and co-founder of Appy Entertainment, a leading mobile games development studio. Tom Mason was a co-founder of Malibu Comics and the company’s Creative Director. He co-created the Ultraverse title Prototype with writer Len Strazewski. Mason is currently an Emmy-winning writer-producer in the big, wide world of television. Thanks, Tom and Chris, for making your case why the Ultraverse is ready for its close-up! What do you think of their list? Did they forget your favorite Ultraverse character? Should Marvel go with their own C-list characters rather than develop these Ultraverse properties? Does the loyal devotion of Facebook’s Ultraverse group indicate the Ultraverse still has the capacity for mass appeal? Sound off in comments, below! Top 5 Captain America Graphic Novels You Can Actually Buy (Sometimes), Read, And Enjoy! Editor’s Note: With Iron Man 3 in theaters this week I could think of no better time for a guest blog from my old pal Chris Ulm, who is a fine writer, a giant nerd, and the biggest Iron Man geek I know. Take it away, Ulm! As I write this, we are exactly seven days away from Iron Man 3 hitting the big screen. Despite my inappropriate level of disappointment with the various trailers that have been released so far, I will be first in line. Why? My father reluctantly bought the tattered and beat up issue (in those pre-comic book store days, all of the comics I bought were characterized by embedded dents and folds from being pressed into wire racks and fondled by filthy urchins such as yours truly). I was instantly enthralled. Entitled “Why Must There Be An Iron Man,” this re-telling of Iron Man’s origin was written by Roy Thomas and illustrated by Barry Windsor Smith. The story absolutely captivated me and turned me into a comic book nut. Thomas did a masterful job of recapping Tony Stark’s ill-fated journey into Vietnam, his subsequent ambush and race against the clock to build a weapon of vengeance with the help of kindly Dr. Yinsen. As I breathlessly read the issue, the first nine years of continuity exploded into my brain. I learned about Iron Man’s friends, lovers and enemies. About the Avengers, S.H.I.E.L.D., the rogues gallery — all the sturm und drang typical of Silver age Marvel under Stan Lee and Roy Thomas. The story was told with economy typical of Thomas’ work. 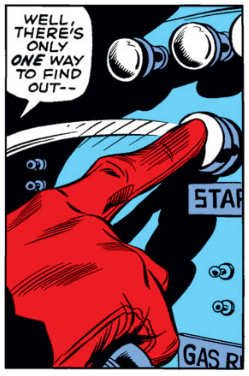 It probably helped immensely that In 1972, Iron Man has only been around for nine years and the Marvel Universe was only a tad older. To put it in perspective, Hollywood brought Marvel’s Spider-Man to the screen ten years ago, and the comic book Marvel Universe is now over 50 years old. Back then, ol Shellhead’s back story felt both infinite and containable to my young mind. Set as a series of flashbacks at a funeral, Barry’s art knocked me out. I loved the different incarnations of Iron Man and the sense of progress that was held within the strip. Much later, I would have the privilege of co-creating Rune with Barry during my long tenure as Malibu Comics Editor-In-Chief. After consuming this issue, Iron Man instantly became my favorite character of all time. I knew it in my guts — but I couldn’t have told you why — at least not then. Iron Man was born the same year I was — 1963. 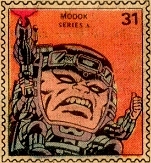 He debuted in Tales of Suspense #39 and was created by Stan Lee, Larry Lieber, Don Heck and Jack Kirby. Stan is reported to have wanted to create a businessman hero patterned after Howard Hughes (in Hughes’ glory days). Lee wanted to create a rich industrialist, a munitions maker, that would be exactly the kind of character that the readers would reject. “… I thought it would be fun to take the kind of character that nobody would like, none of our readers would like, and shove him down their throats and make them like him,” Lee explained. Which was actually very true. Tony Stark was pretty damn unlikeable but his creation was awesome. Iron Man was instantly more captivating to me than any of the other Marvel pantheon. I admired Captain America. A lot. As a young pre-teen, I found that green trash can lids made excellent Adamantium shields and my brother Eric made an equally excellent Red Skull — it was actually amazing how far trash can lids can be flung with enough determination. So Cap was great. And he was right in Tales Of Suspense next to Iron Man. And Spider-Man was likeable and funny. Couldn’t get enough of Spidey. But I didn’t want to BE Cap or Spidey. I liked to read about them. When I read Iron Man, I imagined myself in the role of Tony Stark. It actually helped that Tony was a cipher. Really, Tony was either Reed Richards with a welding helmet, Don Draper with a pimpy mustache or a whiny drunk in need of therapy. Sometimes he was all three in the same issue. In the Silver Age, Cap was a Goody Good, Spidey was a Loser, Thor was a Shakespearean Stiff and Ant Man was … well … ANT MAN. Tony Stark may have been a giant douche but Iron Man was AWESOME. Unlike the vast majority of the Marvel Universe, Iron Man was not a radioactive accident or a product of faulty cosmic ray shielding. Nor was he created by the activation of a happenstance X-gene or being born to the right All Father. No, what I loved about Iron Man is that he is the only Silver Age Marvel character that created himself. (I refuse to count Ant Man). But by a large, Iron Man bootstrapped his abilities by using his brain to build better tools. Repulser Rays? Check! Uni Beams? Check! Jet powered roller skates? Check and check again! See, if you want to be Batman, you have to take on a lot of emotional baggage. There is no Batman without the death of Bruce’s parents. There is no Batman without the ongoing evil of Gotham City to motivate him. Not true for Iron Man. Stark can be tinkering in the sunlight of Malibu in between assignations with strippers. Even Stark’s problems are all self-created. He’s a drunk. He treats women like dirt and can’t commit. He throws away his money and lets evil corporations buy him out. All his own fault. I just knew I could have done so much better, given a big slice of genius and inexhaustible resources. Iron Man 3 opens on my birthday. I’ll be there. Thanks to Chris Ulm for this week’s blog! 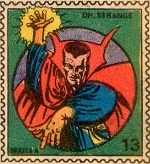 March brings a new Dollar Box column over at StashMyComics.com. 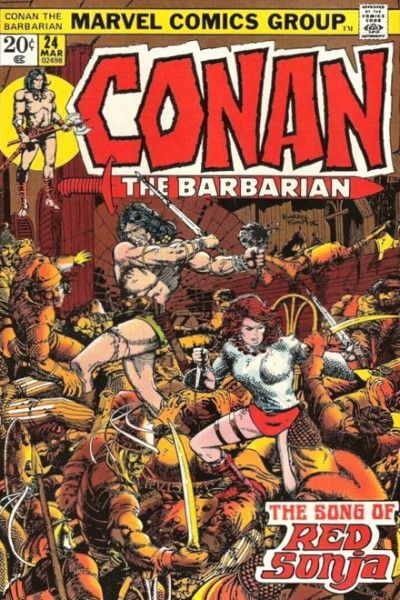 Yesterday I wrote about the not-so-great Red Sonja solo series from the 1970s, but this article is all about Sonja’s origins, in one of the finest single comic book issues of all time — Conan the Barbarian #24. It’s a classic tale from Roy Thomas and Barry Windsor-Smith. Read all about it! Thanks, as always, to StashMyComics.com for hosting The Dollar Box!